09.20.2004 - I am an armadillo hunter. There are two types of armadillo hunters. One is a slack jawed yokel who stalks these critters from the back of a beat-up pickup, shoots it with a 12-gauge, has his dillo hound retrieve the carcass, brings it back and roasts it up for supper, drinks a little moonshine, and scratches the rosy area between his shoulders and head. The other type of armadillo hunter is an educated professional who sets humane cage traps, removes the animal in a timely manner, relocates it to wilderness areas, and goes off to a sophisticated dinner of bean sprouts and fine red wine, and caps the evening off with an intellectual discussion of Wittgenstein over a game of Backgammon. I am the latter. Minus the bean sprouts and backgammon and crap like that. What I mean to say is, I don't actually hunt armadillos, I operate a professional armadillo removal business. I actually don't know all of the legalities of hunting armadillo for sport or food. They aren't native to Florida or Texas or any US state, so they probably aren't protected or regulated in any way. So I guess if there's any real armadillo hunters out there who crave dillo on the half shell or who just like to kill things for sport, that they can do so unabated. That's too bad, because I like armadillos, and I'd rather not see them harmed. For armadillo hunting laws, contact your state's fish & game department. For professional armadillo trapping services, call me in Orlando FL, or check out my nationwide directory of trappers. 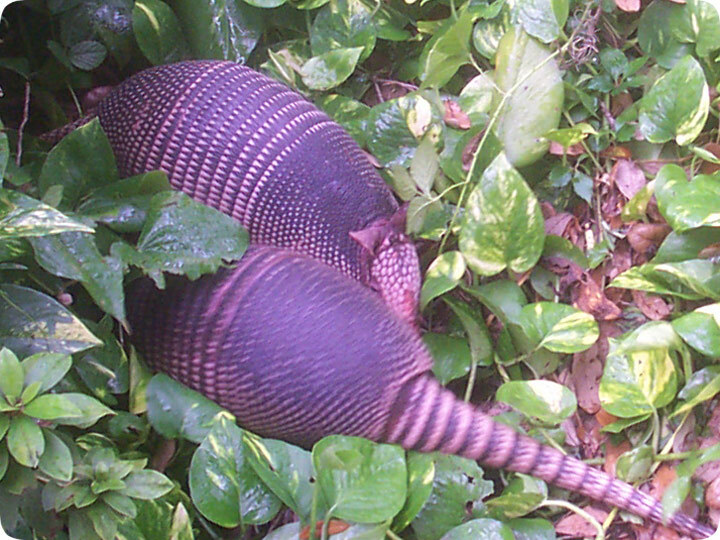 Trapping Armadillos In The Yard - When you awake in the morning to find that an animal has been digging in your yard or garden, then the culprit will often be an armadillo. These animals aren't always to blame, but tell tale signs such as numerous small holes where they have been digging for insects or a larger hole for a burrow will suggest that it could be an armadillo to blame. There are some people who will make recommendations to kill or repel the armadillo, but the best solution will usually be to trap the animal and then to remove it away from the property. When it comes to choosing a trap to catch an armadillo in your yard, it will usually be a choice between a snare and a cage trap. Cage traps usually prove to be the most successful because they are much easier to handle, and will prevent the need for the individual to have direct contact with the animal. Once you have successfully trapped the armadillo, you will need to remove the animal, and if you have a flatbed truck available placing the trap in the back is the best solution. Otherwise, you can place the trap in the boot of a car and carry it at least five miles away.